50 colleges, numerous schools, and a large crowd of productive students. 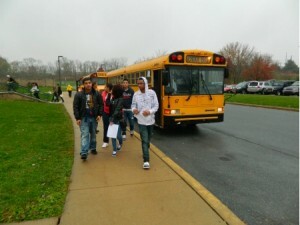 Penn Manor student unload from the McCaskey-provided bus at McCaskey East for the Hispanic College Day. Photo by Amber Brenner. Students, regardless of race, are headed toward a bright future in Lancaster County area schools. McCaskey East High School held its first Hispanic College Day, calling to a large crowd of students from different schools and of different ethnicities. 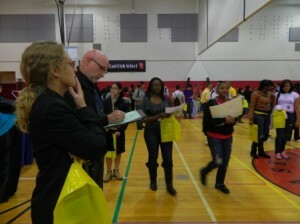 According to Fred Lane, Director of Operations, the event was set up by the school district, and was sponsored by Career Council Inc. Career Council Inc. conducts 75 college expos around the U.S. Only a few are held in Pennsylvania including Philadelphia, however McCaskey’s was the only one held around Lancaster. Penn Manor student, Adrian Viruet, fills out contact cards. Photo by Amber Brenner. “I think the College Day is a good idea because students can explore colleges and see what they can offer Hispanics,” said Chad Wise, senior at Central York High School. “It’s shocking that many Hispanics aren’t going to college, but this is good because it helps students. I’m happy that McCaskey is making an effort,” said Wise. The Hispanic College Day exists because Hispanics are being undermined in the college world. McCaskey is making an effort to help the Hispanic students in each school in Lancaster County. However, some of the Hispanic students that attended the expo should not be undermined. “I am planning to go to a four year college and major in criminal justice,” said Adrian Viruet, junior at Penn Manor. “I plan on going to college for four years,” said Will Torres, senior at McCaskey. Counselor, Mr. Yearsley, and administrator, Mrs. Cox at the Hispanic College Fair on Thursday, November 10. Photo by Amber Brenner. One reason some students may not excel to college is because their parents never went to college. “Neither of my parents went to college, and I wish they had because I would have more benefits,” said Robert Wolpert, senior at McCaskey. When a person’s parents don’t go to college, they may experience a harder life because their parents do not work in a profession, therefore making less money. 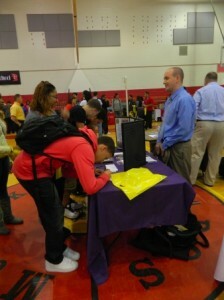 The college expo was a success, and many of the students that attended had new thoughts about going to college. “I learned about colleges I’ve never heard of. This really made me want to explore more minors and majors,” said Joziah Rodriguez, junior at Penn Manor. “This made me more interested in college, and what I want to become,” said Wolpert, who plans to attend college but not immediately after high school.